I understand this is perhaps the most confusing phase in your life. You feel you are matured enough to make your decisions, but you parents think you are still a little child. I guess that's why you are called a teenager. You are stuck in the transition phase of being an adult and being a kid. Dear students, have you decided what you want to do after your SPM or STPM or any course of such level. If you have decided, ask your self why have you chosen this course. Is it because your parents told you, or is it because your friends are doing it so you wanted to fit in or is it because it is your passion. I sincerely hope it is because of your passion, because if not you would regret this decision 5-10 years from now. That is why I say, knowing your passion at this stage of your life can be the most crucial thing you decide in your life. Take a moment to reflect on your self. Identify your strength and weakness. See what interest you the most. Talk to people who are successful in the field you like. Learn from them the process. Place yourself in their shoes to see if you would enjoy the process. Because students, learning is suppose to be a fun process and it will only be fun if you are doing something you are passionate about. 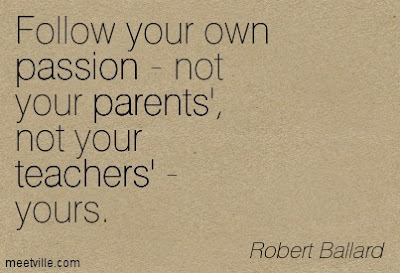 So students go and find out your passion and work towards it!! !